Bright lights, big city… magic spells, witchcraft, wizardry, fairies, devilry, and more. Urban living, at least in fantasy fiction, is full of both magical wonder and dark enchantment. Street kids may have supernatural beings to protect them or have such powers themselves. Brujeria may be part of your way of life. Crimes can be caused (and solved) with occult arts and even a losing sports team’s “curse” can be lifted with wizardry. And be careful of what cab you call—it might take you on a journey beyond belief! Some of the best stories of urban enchantment from the last few years gathered in one volume full of hex appeal and arcane arts. 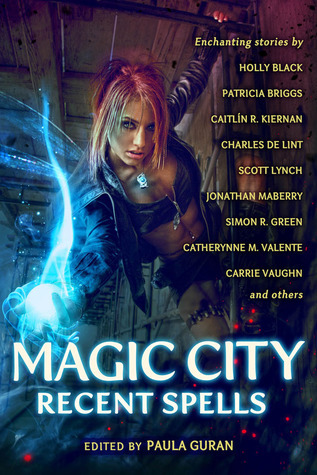 Magic City: Recent Spells is a collection of previously published short stories by some of today’s top urban fantasy authors with a new introduction by Paula Guran. The most important thing to remember when you go to read this anthology is the fact that all of these short stories have been published in other anthologies or made available elsewhere by the authors. 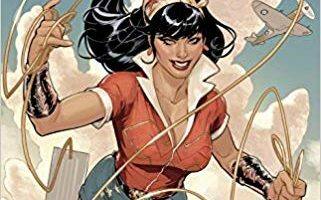 There is no theme behind the anthology and nothing tying them together other than the Paula Guran’s insightful introduction to the genre and the fact they are all urban fantasy. I would suggest not reading the stories in this anthology in the order they are listed as I struggled to get through the first couple stories before they progressively got better. I wasn’t exactly sure how to go about reviewing this anthology and decided to pick the two stories I liked the least as well as the two stories I liked the most and review those. I am a fairly big fan of the urban fantasy genre and had read the majority of these stories back when they had originally been published, so to find any stories in the anthology I did not like in some way was difficult. This was my least favorite story in the anthology and proved to be a “day in the life” story with no real plot or direction. It did provide however, a decent glimpse into the world created by Simon R. Green, and interest me enough that I will definitely check out more of his writing. I still don’t quite know what to think of this one, it was more of a romance story with bits of urban fantasy thrown in to spice it up some. 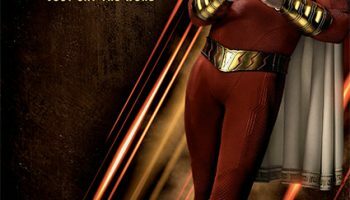 I though the main character was somewhat shallow and found myself a little offended that she would use her magic for something so frivolous as affecting hers and other peoples love lives. I’m not that all that big of a Charles de Lint fan, but this turned out to be one of my favorite stories in the anthology. Brandon is the new kid in town who finds himself in the middle of what is essentially a gang war between the 66 Bandas and the Native kids from the nearby Reservation. It is about doing what is right even when no one else will. 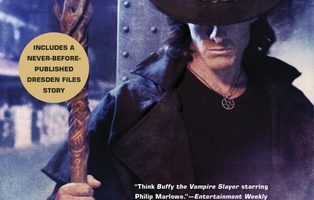 This was by far my favorite story out of them all as is probably no surprise as Jim Butcher is a master of the genre, though I am a little shocked to find a short story of his I have not read. In Curses Harry Dresden is employed by the Chicago Cubs in an attempt to break the Billy Goat Curse. Like any other story in the series Curses is full of Butcher’s trademark humor, the Fae, as well as a certain talking skull. I’d certainly consider this the crowning jewel of this anthology. I would certainly suggest to anyone who is a fan of the genre to check out this anthology, but would also suggest they look carefully to make sure they have not read the majority of the short stories contained within it. For those who have read the majority of the short stories I would suggest buying it anyway, there is no such thing as rereading a story too many times.